A light-weight, universal crampon. G10 is designed to meet the classical demands of general mountaineering. It is perfect for ski touring, trekking, glacier travel, and for women and children (whose small boots don't require many points underneath them). 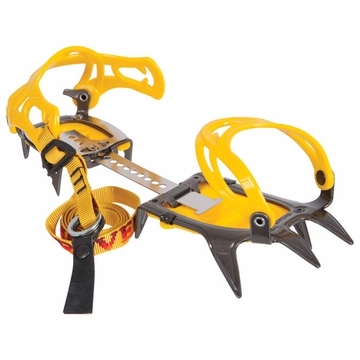 The crampons are fully adjustable by hand, without tools and one size fits all. The G10 includes the world's only active-anti balling system. Actively clearing away snow from under your foot with each step for maximum traction and security when you need it most. Patented by Grivel.